As part of the Road to Greenbuild, the USGBC MA has begun a legacy project at Madison Park High School called the Green Building Tech Club. The after school program starting in September will run 3-5 pm once a week and introduce and prepare the underrepresented community at the vocational high school to “green economy” careers in facilities management. Students involved will be engaged with presentations from various local professionals, a trip to the Expo Hall at Greenbuild 2017, tours of high-performance green buildings in our area, as well as mentorship from Wentworth Institute of Technology Environmental Collaborative. Over 30 students came out to the informational session last week and 15 signed up to be apart of the club when they return to school in the Fall. Almost 50% of the interested students were female and 90% of all students at the high school are people of color. All of the students were interested in the jobs and internships that will come from the participation in this program. It is our hope that the legacy of this club at Madison Park will be a catalyst for developing green building programs in curricula of vocational schools throughout the Commonwealth. The idea for the Green Building Tech Club came from a need to build awareness of the ‘green economy’ career opportunities and to encourage young people to explore these options that they might not have otherwise considered. The USGBC Massachusetts Chapter wants students to be interested in pursuing careers in the trades with a specific eye towards sustainability. We cannot thank Madison Park High School administration and faculty enough for being excited and in full support of this new club for their students. Visit the USGBC MA website for more updates about this year’s Legacy Project, and don’t forget to register for Greenbuild! Last week, the U.S. Government decided to withdraw from the Paris Agreement, a pact the U.S. made with 194 nations to reverse the negative effects of climate change. As sustainability leaders, this is perceived as a giant setback to our mission and what we’re trying to achieve in our daily work—to create a more sustainable future for all. However, every cloud has a silver lining: Because of the administration’s recent decision to withdraw from the Paris Agreement, climate change continues to be an important national and international news item and discussions among political and business leaders carry on. Not only did 1,100 corporations urge President Trump to stay in the deal, but these companies also vowed to uphold their commitment to invest in clean energy. We also saw individual U.S. states and 12 major U.S. cities pledge to pursue policies from the Paris Agreement. The work that we do in sustainable business has never been more important. Now, more than ever, it is up to us to come together and collaborate in ways that make the sustainability movement stronger and more visible—to keep doing what we believe in and to make a difference for future generations to come. At Greenbuild, November 8 to 10 in Boston, it will be time to unite as one movement of 25,000 voices strong and continue to drive the green building movement forward. Everyone. Everywhere. Every Project. We are ALL IN. THIS is why we Greenbuild. 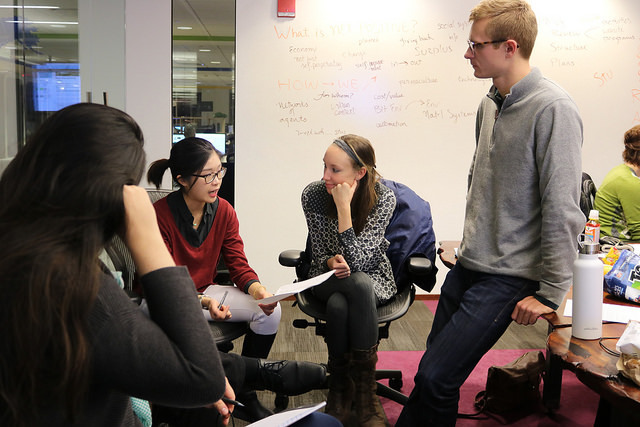 On Friday, April 14th, Emerging Professionals of Massachusetts committee (EPMA) under the USGBC MA chapter partnered with the Northe astern University Energy Systems Society to host local students for a night of learning and networking. They discussed opportunities and challenges that arise as internet connected household technologies become commonplace. 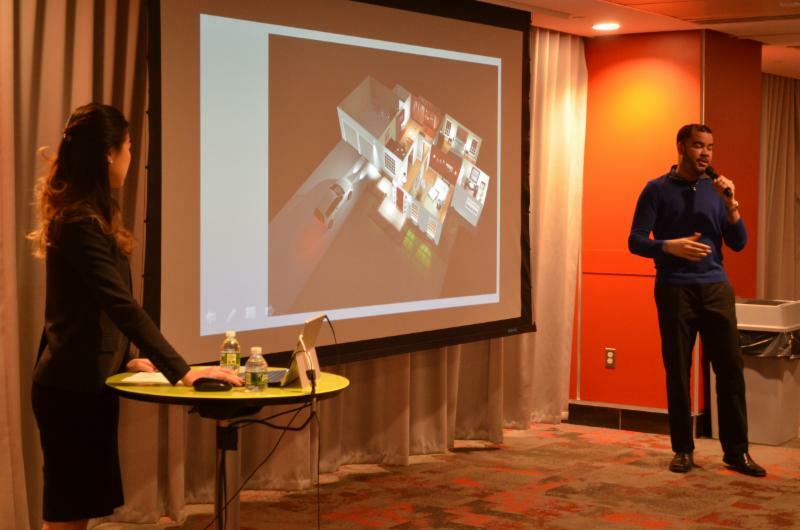 Emerging Professionals committee members May Dussadeevutikul and Oliver Bautista gave an informative presentation, covering how innovations in connected household products present opportunities to enhance the interaction between buildings and people. Smart Homes is an enlightening and horizon-broadening experience. 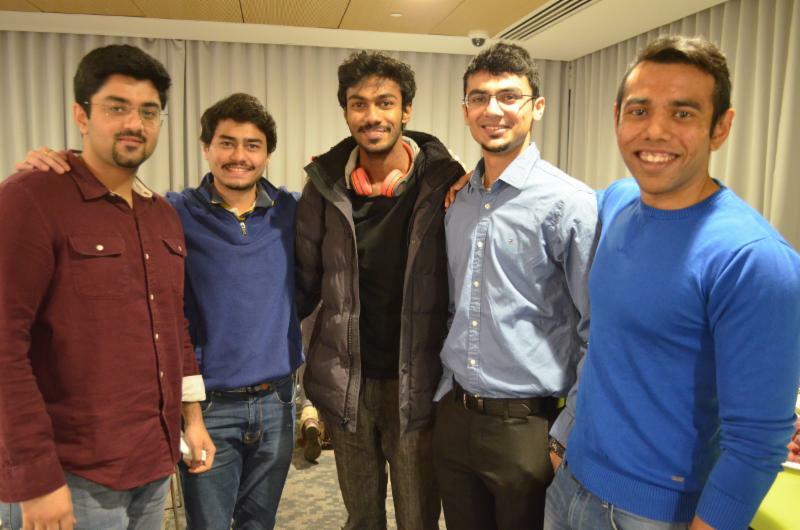 The crowd consisted majorly of engineers from programs like Sustainable Building Solutions, Energy Systems and Civil Engineering from universities around the Greater Boston area. Oliver Bautista and May Dussadeevutikul of EPMA clearly explained the practical use of smart devices. With sufficient pictures, specifications and accounts of their personal use of smart devices this experience enabled us to realize how effective and satisfying it is to personalize one’s home using modern hi-tech gadgets. Some of the smart devices discussed were fans, thermostats, smartphones, personal assistants (like Amazon Echo-dot), crock-pots, ovens, fridges and doorbells. With a highly participative and aware audience questions regarding the energy efficiency of these devices were asked to which Oliver and May gave their expert opinions of how some of these save electricity while giving luxurious convenience to a customer. With the dial tilted to a customer’s convenience, it was an eye opener to realize the direction where technology of home appliances is moving. They also explained how a smart home with smart gadgets can not only bring in comfort, but also create opportunities for energy conservation. Students questioned the advantages to energy efficiency, accessibility, and security, as well as challenges that are likely to arise with emerging technologies. After the presentation, the conversation continued regarding expectations and predictions for the smart homes industry, and the potential impact of the Internet of Things on the environmental performance of buildings. Thanks to Northeastern University Energy Systems Society for hosting the event and our event sponsor, Atlantic Toyota Dealership in Lynn, MA on the Lynnway! Have you ever wondered where your trash ends up? I live in Downtown Boston, and twice-weekly a garbage truck comes through my North End neighborhood and picks up my trash. It magically disappears, but where does it go? Do you know where your trash goes? If you did know, would it change your behavior for how you handle your waste and recycling? What are the impacts on the environment – both inside and outside our cities? Greenbuild’s Greening Committee wants to know the answers to these questions. Each year, Greenbuild challenges itself to walk the talk of sustainability. This year’s attendance goal of 30,000 means a lot of trash at our convention center in Boston, Massachusetts. How much trash will you put on the pile at Greenbuild 2017? USGBC plans to find out while also engaging student volunteers to provide program information, or “talking trash,” at each waste and recycling station on the convention trade show floor. So, what kind of trash talk will be happening? In the months leading up to and at Greenbuild, our committee will be talking about WasteWise, a program developed by the U.S. Environmental Protection Agency. WasteWise helps organizations reduce their impact on global climate change through waste reduction. WasteWise also gives you a guide to tracking waste in EnergyStar Portfolio Manager. The WasteWise program will be the foundation for “talking trash” points at Greenbuild 2017. The Commonwealth of Massachusetts is targeting a 30% reduction of trash by 2020 and 80% reduction by 2050 from a 2008 baseline. As of 2015, Massachusetts saw a 16% reduction. Like many other states across the U.S., Massachusetts is challenged with what do with its trash. The Commonwealth sends its waste to municipal landfills, incineration stations, and other states via waste-by-rail. On the bright side, recycling has been a tremendous success in the Commonwealth. Another great initiative is “waste to energy” programs. Expect to learn more about the Commonwealth’s waste and recycling programs from Greenbuild 2017’s “talking trash” initiative. The City of Boston will play a critical role in the Commonwealth’s waste reduction goals. Greenovate is “Mayor Walsh’s initiative to get all Bostonians involved in eliminating pollution…” My first involvement with Greenovate was acting as the energy efficiency and renewable energy manager for the City of Boston. Waste diversion strategies live within Greenovate’s Climate Action Plan. The City of Boston’s waste and recycling programs will be “talking trash” points at Greenbuild 2017. What is Greenbuild 2017’s plan for waste diversion and how can you participate? USGBC has a goal of moving Greenbuild towards a Zero Waste Event. In 2015, Greenbuild had an 84% waste diversion rate. This reached 90% in LA last year. How can we eliminate the last 10%? The Greening Committee believes the answers are education, innovation, and the will to do good for future generations. We’ll provide the education, you provide the innovation, and we will collaborate towards a waste-free future. Looking for a Reason to be a Greenbuild Volunteer? 1. Network with green building leaders and professionals. 2. Connect with students across the nation. 3. Attend sessions featuring renowned speakers with a passion for sustainability. 4. See the latest and greatest products and services in the Expo Hall. 5. Explore Boston and have FUN! Join your peers at Greenbuild (the largest green building conference in the world) in Boston this November 8-9, 2017. In fact, you can volunteer at Greenbuild to receive a FREE 3-day pass, in addition other benefits! USGBC Volunteers must be a minimum of 18 years of age and a full time student OR a young professional age 25 and under. When you check into the volunteer room, a fall 2017 schedule or a photo ID will be necessary depending on which qualification the volunteer is participating under. Full time student is 12 credits undergraduate, and nine credit graduate. Share this sign up link with your campus or organization. We’ll keep you updated on events and opportunities and let you know when Greenbuild Volunteer registration opens this summer. Our Super Volunteers are getting out there on your campuses and engaging students like you to get involved with Greenbuild and the USGBC MA Chapter. 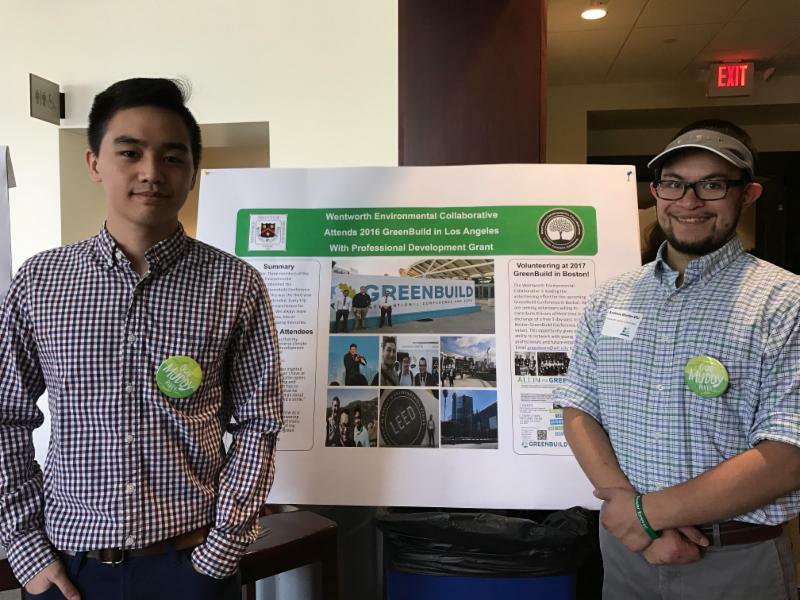 This month, Andrew Brieter-Wu and his team from Wentworth Institute of Technology presented several posters at the 11th Annual Muddy River Symposium. 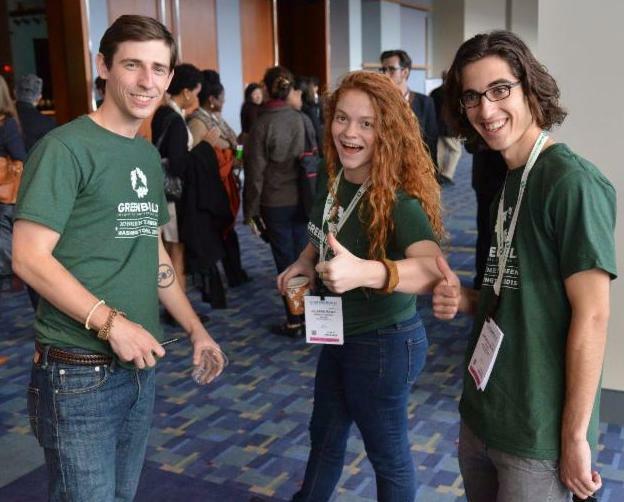 Andrew shared his experience as a Student Volunteer at last year’s Greenbuild in Los Angeles. Last Friday, we had an Energy Mixer event at Northeastern University (NU) organized by the Emerging Professionals committee, and hosted by the NU-Energy Systems Society (NU-ESS). On the fun filled Friday evening, we discussed a variety of newly available gadgets and Smart Home technologies and how these devices innovate our ever-changing lifestyle and offer a wide range of convenience and utility. There are many ways to stay involved between now and Greenbuild. Come to the Emerging Professionals Committee monthly meeting and connect with other green building professionals new to the industry. April 24th at 50 Milk St. Learn More Here. 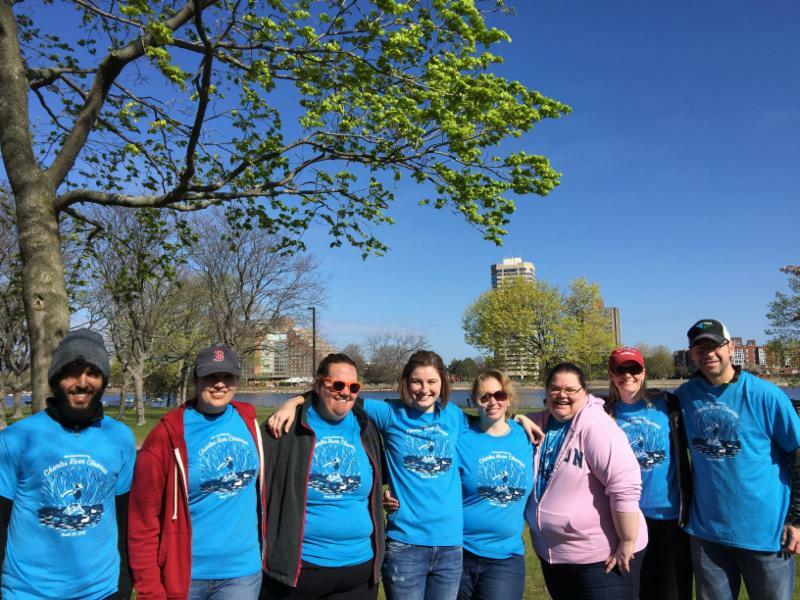 Join EPMA for the 2017 Annual Earth Day Charles River Cleanup. Over 3,000 Boston area volunteers will come together to pick up litter, remove invasive species, and assist with park maintenance along the Charles River. April 29th. Learn more here. Don’t want to wait until November? Come to our next Greenbuild Volunteer Committee meeting to find out how you can become a Super Volunteer and help spread the word to your campus and peers. We are pretty excited for Greenbuild, we hope you are too! (Washington, D.C.) – Jan. 25, 2017 – Today, the U.S. Green Building Council (USGBC) announced the Top 10 States for LEED, an annual ranking that highlights states throughout the United States that made significant strides in sustainable building design, construction and transformation over the past year. LEED, or Leadership in Energy and Environmental Design, is the world’s most widely used and recognized green building rating system. Topping the list is Massachusetts, which moved from third to first place with a total of 136 LEED certified projects representing 3.73 square feet of certified space per resident. A continued presence on the list from Maryland and Virginia has reaffirmed the mid-Atlantic region, which includes Washington, D.C. as the epicenter of green building. While Washington, D.C. is not included in the list of top states due to its status as a federal territory, it is notable as it offers 29.04 square feet of LEED space per resident, more than any individual state. This year’s list has the highest average (2.55) per capita LEED certified space among the top 10 states since 2010. Four of the nine states included in the 2015 list increased the square feet of space they certified per resident in 2016 (Massachusetts, Colorado, California and Virginia). Collectively, 1,819 commercial and institutional projects achieved LEED certification in the 10 stateswithin the Top 10 LEED list in 2016, representing 309.12 million gross square feet of real estate. And across the U.S., 3,366 projects were LEED certified in 2016, representing 470.39 million square feet. The LEED green building certification system is the foremost program for the design, construction, maintenance and operations of green buildings. More than 59,000 commercial, neighborhood and residential projects are currently LEED certified, comprising more than six billion square feet of construction space in all 50 states in the U.S. and in more than 164 countries and territories globally. Green construction is also a large economic driver. According to USGBC’s 2015 Green Building Economic Impact Study, green construction will account for more than 3.3 million U.S. jobs – more than one-third of the entire U.S. construction sector – and generate $190.3 billion in labor earnings by 2018. The industry’s direct contribution to U.S. Gross Domestic Product (GDP) is also expected to reach $303.5 billion from 2015-2018. The U.S. Green Building Council (USGBC) is committed to a prosperous and sustainable future through cost-efficient and energy-saving green buildings. USGBC works toward its mission of market transformation through its LEED green building program, robust educational offerings, a nationwide network of chapters and affiliates, the annual Greenbuild International Conference & Expo, the Center for Green Schools and advocacy in support of public policy that encourages and enables green buildings and communities. For more information, visit usgbc.org and connect on Twitter, Facebook and LinkedIn. As a teaser to our comprehensive Greenbuild Sustainability Report coming out this March, here are our Top 5 sustainability stories from Greenbuild 2016 in Los Angeles, CA. Early in 2016, the Greenbuild Waste Team set a goal diversion rate of 85% for the Greenbuild conference based on the LA Convention Center’s baseline diversion rate of 72%. This dedicated group worked for 6 months to add compost bins in the public spaces, find haulers for additional waste streams and fine-tune the back of house sorting process for all waste generated by the Greenbuild show. This group, Greenbuild volunteers and a waste sorting team from ABM and UnitedService Companies, made it possible to exceed our goal and achieve a 90% waste diversion rate. Each year, our Exhibitor Donation Program collects leftover booth materials from Greenbuild Exhibitors. This year, exhibitors donated just over 14,500 pounds of materials. Almost 9,000 pounds of materials came from KB Homes – Hanley Wood. Hanley Wood built a model home on the show floor and chose to donate many items from the exhibit. Donations included construction materials such as doors, windows, kitchen and bathroom cabinets, countertops, a sliding glass door, and patio decking. Additionally, they donated all the appliances and décor including a washer & dryer, cook top, oven, LIVE Grow Wall with plants, rugs and books. All items were donated to local non-profits including Habitat for Humanity and T4T.org; which will repurpose the materials to support S.T.E.A.M. (Science, Technology, Engineering, Arts and Math) education programs for underserved communities in the Los Angeles region. Each year, Greenbuild works with the Greenbuild Hotels to provide resources and education around sustainable hotel operations. This information helps hotels adhere to the mandatory sustainability contract language in Greenbuild contracts and furthers their hotel’s greening efforts. In 2016, 100% of the hotels participated in a hotel audit during the show to confirm the implementation of the greening guidelines at their property. Thanks to the great efforts of the Levy team at the LA Convention Center, 56% of the food served at the convention center was sourced locally (within 100 miles) and 87% of the food was sourced regionally (within 500 miles). For the first time, Greenbuild will purchase water restoration certificates to balance the water used at the LA Convention Center during the conference. This was made possible through a partnership with the Bonneville Environmental Foundation (BEF) and TerraPass. Attendees had the opportunity to further balance their water use by participating in the Change the Course program which restored 1,000 gallons of water to wetlands across North America each time an attendee pledged to take action to reduce their water use. At Greenbuild, we don’t just like to claim that we’re into building a better world through green building. With the trade show industry generating up to 600,000 tons of garbage a year, we do what we can from planning to implementation of the show to make the most sustainable choices, allowing us to leave a much lighter carbon footprint in the end. Helping us make a significant impact on our waste reduction efforts are the Greenbuild exhibitors. Exhibitors must comply with the Greenbuild Mandatory Exhibitor Greening Guidelines, otherwise known as GMEGG. With each exhibiting company committing to sustainable exhibiting practices and making small changes to the way they exhibit, it adds up to a massive effort! But there are those exhibitors who kick it up a notch, going above and beyond the “normal” GMEGG standards. This year, we recognized three companies for their exemplary efforts with the Green Exhibitor Award. Quanex has used and reused their entire booth structure for the the past 5+ years. Configured as a pod type system that allows them to bolt-on or remove sections, depending on each show, to minimize shipping weight, materials and space. The Roll-A-Shade booth structure consists of scrap racking cut from their warehouse. The metal used was on the way to recycling, so they decided to re-purpose the metal and create a booth that can be reused, converted back into warehouse racking, or sent off to recycling (again). Skanska told us that their booth is a zero-waste booth. To ensure this, they give out no collateral and focus on conversation and technology for follow-up needs. Thank you to all of our exhibitors at this year’s show in Los Angeles for helping Greenbuild walk that talk! When you attend Greenbuild, you get a sense that there’s more to the attendee than someone looking to gain a few CEUs. Those in attendance always comment on the genuine spirit of the show that goes beyond sustainable building and design, a spirit of camaraderie and a common interest for the greater good of our planet. Now, when you think of Greenbuild’s Passport to Prizes drawing, you may conjure up images of a large group of folks who are tired, maybe a little anxious, after a couple of days of walking the expansive Greenbuild expo hall to get their passports filled. A little less spirit filled and a little more anxiety driven. But this year, things were a little different. When the name was drawn for our $10,000 grand prize, nobody could have expected what happened next! During Greenbuild, news arrived that Hurricane Matthew was heading toward Florida, but not before taking its devastating toll on Haiti. The news became a huge impromptu topic in many Greenbuild sessions and weighed heavy on the minds of this socially conscious group. So when Dan, a LEED Fellow, was announced as the $10,000 grand prize winner, it was a no-brainer to he and his wife Nancy to donate half of their winnings to the U.S. Green Building Council’s Project Haiti: The William Jefferson Clinton Children’s Center, the first LEED certified orphanage in Haiti. Because of this, we wanted to take this time to thank Dan and Nancy for their gift and for exemplifying the true spirit of Greenbuild. You are invited to find out how a long overlooked area of Los Angeles has become the thriving and vibrant L.A. Sports and Entertainment District (LASED) that we enjoy today! The L.A. Sports and Entertainment District Master Plan was the key document that established the vision for the sustainable development of STAPLES Center, L.A. LIVE, and adjoining boundary properties. The project’s impact on the community has been tremendous – close to 1,500 annual events in and around Microsoft Square, a vital hub for the community, and now draws pedestrians to an area that was nearly deserted before. Much-needed transit and infrastructure improvements, including rail, bus shuttles, and bike networks have made downtown L.A. much more accessible and the addition of a grocery store has further enticed residents to move downtown from the suburbs. This walking tour will be led by a representative of the design team for the Master Plan, and who will speak about the overall plan and discuss how these types of developments can transform cities into thriving urban fabric. Check out tour TS10 – LA Sports and Entertainment District Master Plan Walking Tour on the Greenbuild website to learn more about the tour and it’s objectives.